Many people might say, "What's the point?" 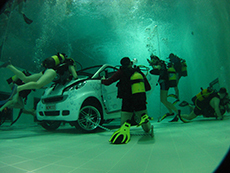 Well, for all the snobs out there (like me before Christmas) who think that diving in Nemo 33 in Brussels is for Mickey Mouse divers: don't knock it before you try it. If you are one of those divers (like me) who get itchy fins during the low season, and breathing underwater has become a means to an end, then Nemo 33 is for you. It is the best way to go deep in December... in a bikini (maybe not for men... well that’s up to you guys). Nemo 33 is a wonder of its own kind. 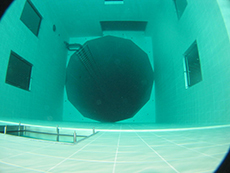 Opened in 2004, the concept of the world’s deepest pool was invented by john Beernaerts. It took over eight years to develop the design of such a pool, the likes of which had never been built before. The idea was to recreate the deep diving conditions of Bora Bora blue lagoons in Europe. Great idea in theory, but in practice it is a bit of a headache of engineering which was successfully accomplished at the beginning of the 21st century. to go without scuba. And for non-divers, there is a bar! (well for divers too). The bar and restaurant offers all sorts of refreshments (Belgian hot chocolate in the top 5) and menus with direct views on the pool via pressure-proof windows. A single one hour dive including all equipment cost 22 euros in peak season (October – April). There are dive/ meal/hotel packs starting at 23€ which are perfect if you want to chill out after the dive or combine it with a city break in Brussels. Contact Nemo 33 directly for bookings and packages. 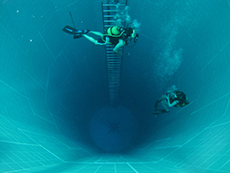 Nemo 33 is also easy to find from the Ring Road R0 exit at Drogenbos. all diving qualifications are accepted. Get there early before the dive as it is pretty busy especially around December – January. Enjoy and if you cant get narc’ed at 34m, just sit upside down, apparently it does the trick.